If only living was as smooth as my smoothies! We celebrated ladies night with gusto, stumbled the night away, and I got to wish a friend a happy birthday. It was just what the doctor ordered. You may already know this, but I love green smoothies. In case you’re popping in for the first time, lemme catch you up to speed. 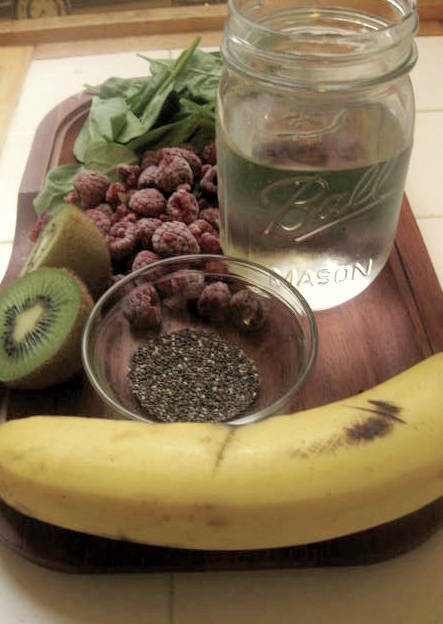 When I first started eating healthy, green smoothies were a very clean drink I added to my diet. So, I guess you could say they are kind of like my first born child that can do no wrong. You can whip one up in three minutes, they aren’t nearly as cumbersome to clean up after compared to fresh juices, you get to use the fiber, and you aren’t stuck with a smelly trash can full of left over pulp. 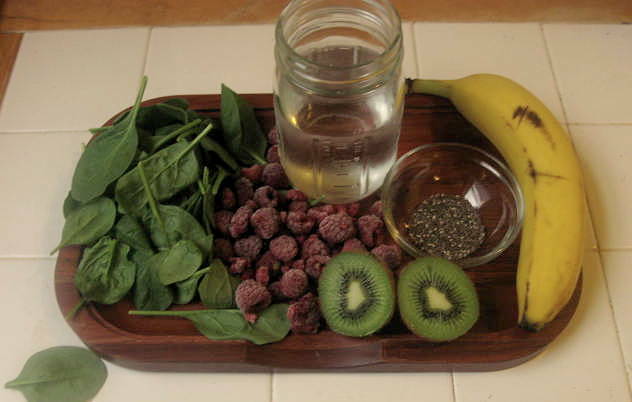 This is what my typical green smoothie looks like. I’ll rotate the fruit around (frozen blueberries are finally cheap enough to buy again and the kiwi was an unexpected add in, but I gotta get to them before the fruit flies do! ), and sometimes I’ll use some ground flax seed in place of chia—though I’m totally digging chia at the moment—but this is the basic set up. I’ve been doing this by feel for the past year and a half, meaning I don’t use exact measurements except with the chia and flax (1 tablespoon). I know what fruit flavors don’t come through as strongly, which, depending on the mood, may mean I’m less liberal with the spinach. I know if I’m using chia seeds to add them in last; if you put them in first they will get stuck at the bottom of the blender and it’ll be a pain in the cheekies to clean. I know pineapple leaves a horrible stringy mess which irritates my texture phobic mouth and gets stuck all up in my teeth. But I have faith you’ll figure out the perfect ratio for yourself! I really enjoy the energy these drinks give me, and how clean they are, but every now and then I like to treat myself to a “naughtier” smoothie. I was marinating some Moo Ping earlier (yup, the Thai food kick is still going strong), and I had a lot of leftover coconut milk. And thus the coconut milk smoothie happened. This one has a lot more calories since I wasn’t using water at the base, but coconut milk has some great benefits (unfortunately #10 isn’t terribly useful for me!). Consider it a very special treat or make it as a breakfast or lunch for a day you know you are going to be busy and might not be able to snack as often or get in a full meal. I haven’t had a coconut milk smoothie in about 7 months, so I think I can take the calorie and fat hit. Pour in coconut milk and sliced up bananas. Blend for a few sections. 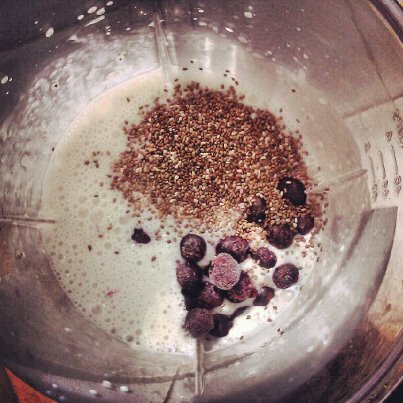 Then add in blueberries and chia seeds. Blend until mixed together, when there is no more white showing.